Parasitic disease continues to constitute a major global threat. 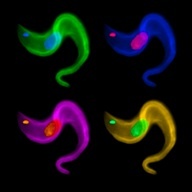 We study fundamental aspects of parasite biology to identify new therapeutic targets for clinical intervention, focusing on the African Trypanosome, Trypanosoma brucei (the causal agent of sleeping sickness in humans and livestock in sub-Saharan Africa), and specifically macromolecular transport, signaling, gene expression and evolution. 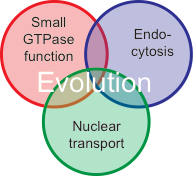 Our specific areas of research interest include: The roles of components of the endocytotic pathway in drug sensitivity, virulence in vivo and protein/lipid sorting mechanisms, understanding the contribution of the nuclear pore complex and nuclear envelope on gene expression and reconstructing the evolutionary history of intracellular transport pathways and the origins of the eukaryotic cell.